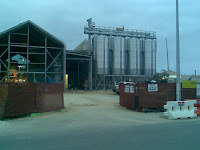 Couple of brewing jobs available at Fremantle's Little Creatures Brewery. XPERIENCED BREWER On shift and reporting to the Production Brewer, this hands-on person will share the responsibility of the team and rise to the challenge to produce an award winning range of beers that are, on-time, in-spec and on-budget. A technical background (brewing, science, engineering, etc) is desired together with a minimum of three years’ experience as a brewer in a commercial operation. Our goal is simply to make outstanding beer that we are all immensely proud of – passionate brewing professionals should only apply. TRAINEE BREWER We are looking to recruit a recent graduate to train as a Brewer. The role will suit an individual who has a professional outlook, is career focused and is enthusiastic about brewing and science. The Brewery offers are very multi-skilled environment, and you will find yourself working in all aspects of brewing, processing and packaging. Interested people with relevant trade-based skills and passion for our industry are also encouraged to apply. Oktoberfest Celebrations in Perth and New Brewery Speculations? Looking for somewhere to get into the Oktoberfest spirit? They are celebrating Oktoberfest throughout the month at the Indian Ocean Brewhaus - where you can purchase a limited edition 1 litre Indi Stein, filled with the Indi brew of your choice for a bargain $25, plus if you buy any Indi Beer during Oktoberfest you go into the draw to WIN the Ultimate Indi Party Pack! Pack Includes: - Kegorator Bar Fridge- 50L Keg of Indi Beer - 8 x Branded Indi Pint glasses. 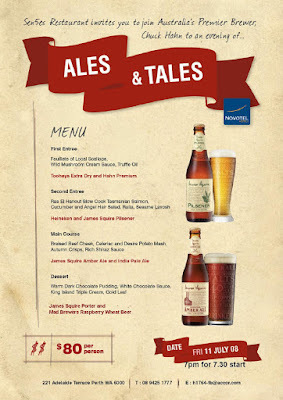 Whilst sampling the beer, why not check out the traditional Bavarian menu on offer. Duckstein in the Swan Valley on Saturday 25th October are having a special Oktoberfest party featuring live music all day and into the night; The Dolomiten Polka Band, Nancy & Christa's German Duo and some popular music from Alan the Music Man. Festivities commence at 11am and traditional German singing and dancing will be the order of the day. A special Oktoberfest Beer has been prepared for the occasion. Bookings are highly recommended. And at Elmars in the Valley on Sat 25th & 26th October more Germanic fun and games can be had with their annual celebrations - Free entry with your purchase of either $5 beer/wine glass or $15 1 ltr Stein. Festivities kick off at 11am both days, finishing late on the Saturday and at 5pm on the Sunday. Get down down there for a feast of German beer, food and music. 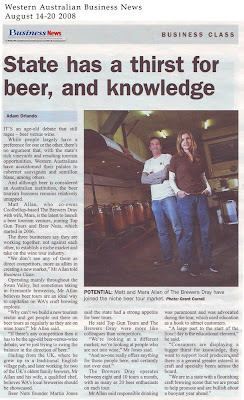 And whilst troubles seem to continue at Fremantle's Mad Monk, (see article) it doesnt seem to halt the interest in new breweries in WA. 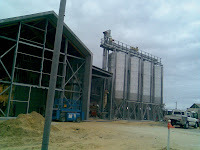 As previously written, plans are afoot for a new brewing operation within the revamped Northbridge development, there are rumours abound of a new brewery in Midland and has anybody wondered why Chuck Hahn is spending so much time in town?? Perhaps it is time that a James Squire Brewhouse opened up in Perth? Watch this space for news updates. The 31st Great British Beer Festival at Earls Court, London, kicks off today, with a five day feast of over 450 real ales, ciders, perries and international beers. The usual beer festival activities are on offer once again where you can play some traditional english pub games, enjoy live music, sample some good old fashioned pub snacks and also attend tutored beer tastings. And perhaps most importantly for the brewers of the Bristish Isles, the announcements for the esteemed Champion Beer of Britain are announced. 2005 and 2006 were double winning years for the Essex brewer, Crouch Vale, taking away the top gong with the sensational Brewers Gold, and 2007 was once again the year of the underrated Mild style of ale (Moorhouse's Black Cat was the last Mild to to take overall Gold in 2000), with Shropshire brewer, Hobsons taking the plaudits. We are pleased to announce with super quick speed direct from London that this years major winners are: CBoB Gold: Altons Pride from Triple fff (Hampshire), Beckstones Black Dog Freddy's Mild was awarded silver overall with bronze going to Wickwar's Station Porter, the champion winter beer from earlier in the year. Altons Pride has for many years been a great beer available throughout its local area and is most deserving. Congratulations also to Ray from Wickwar, a fellow stalwart from Matt Jacksons Wednesday Club in Bristol, onya Ray! Highlighted on My Boozewatch this week is an Aussie Classic at a great price. Take advantage of the Woolworth Liquor deal throughout Perth on Coopers Sparkling Ale. This iconic Australian stand out is available until 10th August at $44.98 per 24. And don't forget the extra volume value you get with this 375ml beer over the majority of mainstream international imports. If you can't get to Woolies, then remember you can also visit a 1st Choice Liquor outlet, and quote Woolies advertised price - and under their price guarantee, they will let you have it for the same price! Click on the image above to take you straight to a copy of The Brewers Dray - Boutique Beer Explorer's new flyer design. Indian Ocean Brewhaus are the latest to offer up their beer range in packaged format following the installation of a four head bottling line to their brewing facility in Mindarie. On display at the recent Perth Good Food Show the White, Pale Ale & Pilsner are currently available to purchase from the brewery for $18 per 6 pack. Another WA brewer showing off their new bottling line are Albany's Tanglehead, who hope to increase both their brewing capacity and current packaged line up. Keep an eye out too for the South Wests Cowaramup Brewing Company who are advanced in plans to release their beers in similar packaging to that of Tasmania's Moo Brew (pictured) - From Moo Brew to Cow Town, What could be more suited? The Indian Ocean Brewhaus at Mindarie Keys have released a new date for the 'Indi International Beer Dinner', presumably replacing last months postponement. The event is due to be held on Friday 3rd October, coinciding with their 2008 Oktoberfest celebrations - get it into your diary and call to book on 9400 1187. 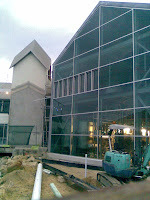 Construction at Little Creatures in Fremantle continues at great pace, as these latest photo's show. The super structure is now in place, bridging the gap between the original americas cup shed/crocodile farm and the deconstructed Harbourside nightclub (now home to Creatures Loft), which was purchased in a multi -million dollar deal about 18 months ago. Lets hope that the finalised plans have plenty of additional outdoor seating for those lazy summer days, sunnies on and a pint of pale in hand! 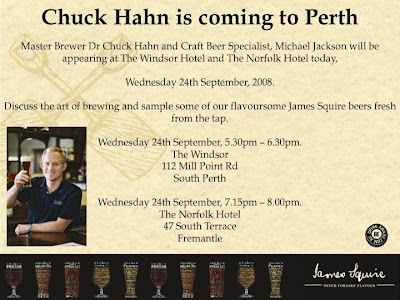 Brewing legend Chuck Hahn returns to Perth for another beer & food lovers evening. This time hosted by Sen5es Restaurant at the Novotel, Adelaide Terrace, Perth. I went to a similar event not too long back and had a thoroughly enjoyable evening and $80's seems like great value. It's happening on Friday 11th July 2008 and is a must for those lovers of the James Squire beer range. Happy hour every day from 3:30pm - 4:30pm. Elmars in the Valley, Swan Valley - A relatively new addition on the bar is the 6.1% Maibock, replacing the dunkel. Light golden in colour, low hopping and pleasant malt fruitiness. Would probably prefer it in a Munich biergarten at this time of the year, but you cant have everything! Mad Monk, Fremantle - Big improvements as time has gone on. Service levels have improved and table availability is better, however, they do at times look a little stretched with the numbers on the floor. A previous gripe was the ambiguously titled 'large' & 'regular' servings - this has been rectified, with a 660ml serve of in-house brew available for around $9 - seems like great value. Funky new designs seem to have appeared on the large street facing wall (or maybe I had been there too long?! ), there is an expanded non-dining drinking area, live music sunday arvo, the beer range has expanded to six, with an IPA and Porter the latest additions. Founding brewer, Richard Moroney has moved on, and it appears that local brewing legend, Hugh Dunn, currently controls the mash tun alongside Justin Fox. Food has always been excellent. Its great to see a new operator seemingly getting to grips with their market. Essex St Organic Cafe, Fremantle - Have been receiving some good local press lately on the organic eats and were stocking Richmond brewer, Mountain Goat, IPA at $8 per stubby. Lyrebird, Fremantle - New addition to the dining scene Freo, based down at Fishing Boat Harbour. Menu unfortunately didn't really live up to the press hype, delivering fairly standard pub/tavern fayre. Grolsch & Peroni available by the stubby, Becks, Heineken, James Squire Golden and the usual uber brands on tap. Wot no WA craft beers Lyrebird? Sail & Anchor, Fremantle - Sad to hear that head brewer Mel Secourable has moved down to Margaret River to head the brewing team at Colonial, hopefully new head honcho Fiona can continue the good work. Pleasantly surprised on a recent visit, when actually receiving the kind of attentive service that we were used to 4 or 5 years ago. Ive always enjoyed the brews on offer, however, recent times have seen a drop in interest and knowledge of bar staff, it was great to assisted by someone displaying the opposite - hopefully a taste of things to come. Clancy's, Fremantle - Wonderful paint job and general tidy up are just the tonic for this beer lovers haven. Rarely can I say anything bad about these guys, and this time is no different! Northbridge Brewing Co - Awaiting further news on developments at the new city centre site proposed by Mustang Bar owner Mike Keilor’s Clearview. Other than 'The Brass Monkey', it's fairly tough to find a decent pint in Northbridge, so this has to be a winner. Drink Better, Drink Local! Three Western Australian Brewers Association members are showcasing the wonderful art of pairing beer and food, with in-house beer dinners later this month. What a perfect excuse for a weekend getaway down south!! 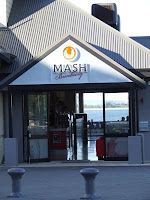 Just a day earlier, on Friday 27th, you can head to Mash Brewery in the Swan Valley for their innaugural beer degustation dinner. The evening aims to showcase their award winning range of hand crafted beers For $110 pp you will be treated to at least 9 different beers and 13 courses, all perfectly matched to highlight the strengths of coupling beer with food. Hear all about the different styles of beer produced at Mash, straight from the brewers, Dan & Mark, with insights into the brewing process and raw materials used. Seats are limited to just 120, so get in quick to book your place by calling the brewery on 92965588.